As the sunshine continues, the fun never stops at Cadbury World with a variety of indoor and outdoor activities to enjoy this summer. Families visiting Cadbury World can make the most of the weather outside and enjoy a world full of delights at the Bournville-based attraction. Before heading inside Cadbury World’s fully air-conditioned building to explore the exciting array of chocolatey zones, young visitors can take on the heights of the African Adventure Play Area. 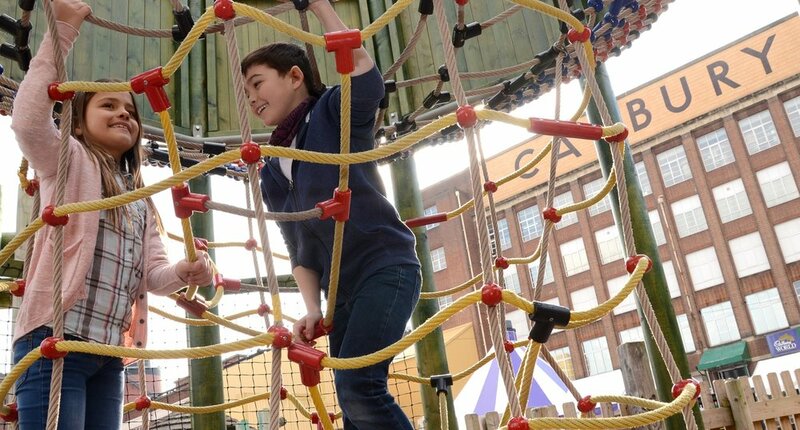 As well as three stories of tube slides, climbing zones, and rope bridges to discover, there’s a section designed for the under-fives and a specially-created wheelchair friendly play area – plus plenty of space for adults to relax and unwind in the sunshine. During the summer holidays, Cadbury World will be giving visitors a brand-new way to experience the attraction as young detectives set off on an adventure to find Freddo’s lost hop. An assortment of clues will be hidden throughout Cadbury World’s zones as children are invited to follow the trail and solve the mystery. Each child that completes the challenge will receive a special Freddo gift. After an action-packed adventure, guests can cool off at the Cadbury Café with a selection of summertime treats including delicious themed frappés, refreshing milkshakes, and scrumptious ice creams complete with a choice of mouth-watering toppings. From 21st – 31st July, Cadbury World will also raise the curtain on two original live shows; Partytime with Freddo which will allow guests to join the famous frog for fun and a sprinkling of mayhem in his birthday party preparations, and Storytime with the Caramel Bunny which invites young audience members to become part of her favourite fable in an exciting interactive show. Character Breakfasts are also on the menu from 21st – 31st July, where guests can once again meet and greet some of Cadbury’s most iconic characters – shaking hands with Freddo, high fiving Mr Cadbury’s Parrot and posing for a selfie with the Caramel Bunny. As well as sharing personal magical moments with the lovable characters, visitors can also tuck into a delicious treat of either a full English breakfast (vegetarian option also available), sausage, bacon or egg muffin, or American pancakes or waffle with Cadbury chocolate sauce, bananas and cream. All options are served with a choice of orange juice, tea, coffee or, of course, hot chocolate. Those enjoying Character Breakfasts will also benefit from priority entry to Cadbury World and its two rides; the 4D cinema and Cadabra. Breakfast treats are priced from £6.99 per person and can be booked online at cadburyworld.co.uk. From 1st August – 2nd September, a variety of magicians, ventriloquists and entertainers will cast a magical spell over visitors with a host of family entertainment and live shows. Enjoy giggles and games for the whole family plus photo opportunities with the Cadbury Characters to make those ever-lasting memories. All entertainment and live shows are included in the Cadbury World admission cost. Beyond the range of additional activities, visitors can head to the 4D Chocolate Adventure zone to ride the Crunchie Rollercoaster and experience the feeling of diving into melted chocolate in a 4D cinema experience complete with motion seats, before heading over to the Chocolate Making zone to see the chocolatiers in action and taking a delicious taster for themselves. Guests can experience the digital chocolate delights of the Purple Planet where they have the opportunity to grow their own virtual cocoa tree, dance in virtual chocolate rain and chase Creme Eggs, before heading to Advertising Avenue to come face-to-face with everyone’s favourite drumming gorilla. For more information about Cadbury World, or to book tickets, visit www.cadburyworld.co.uk.